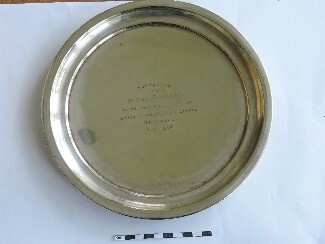 Silver plate presented to teacher Miss K B Parry on leaving the school in 1932. 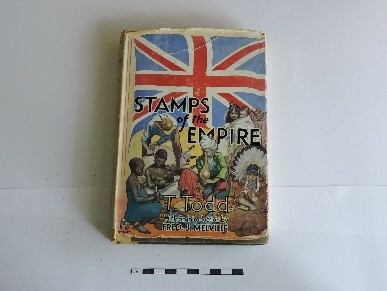 Presentation book “Stamps of the Empire”, Presented to Kim Beachcroft Jones for good work and steady progress. July 1952. Signed by the Headmistress. The school was originally located at the top of Greenfield Valley and was saved as an example of a Victorian school to be reconstructed here at the museum in the 1980s. It first opened in 1877 and the first teacher was Mrs Emma Parry. She was known to be very strict as were most Victorian teachers but she was devoted to the children in her care. She kept a log book of everything that happened in the school and we have a facsimile in our archive. In 1912 the children were treated to a special tea by the Railway Company as part of a celebration for the opening of the new Holywell Junction station. Mrs Parry retired in 1918 after working at Spring Gardens School for 41 years. Another teacher called Miss Parry was headteacher from 1922-1932 and was presented with a silver tea service by the children on her retirement. An inscribed plate from the tea service is in our collection and on display in the school. By the 1960s the school had outgrown its original purpose and it was abandoned. Local people set up a museum at Greenfield and the school was taken down and reconstructed here as part of the museum. We also have a large number of school photographs of former pupils from throughout the 20th century, especially the 1940s and 1950s. Might you be on one of them? A number of photos are on display in the school room but there are more in the archive which can be viewed by appointment and copies provided if requested.